What manga, anime, or TV series would you like to see have a remake? Definitely would have to say Trigun. There’s SO much more that can be animated. I adored the movie to pieces, but still would love to see more. If you became a magical girl/guy, what would be your speech/catchphrase? Ooh! That’s a tough one! I don’t watch a lot of magical girl/boy shows, so I’m drawing a blank. What’s something really cool or interesting you own? I now have a lot of autographed items in my collection, but I still find this one particular item as my favorite. It’s an autographed item from AnimeFest 2010. I went to a voice actor autograph session for Christopher Sabat and J. Micheal Tatum and I didn’t have anything they could sign other than my dealer room shopping list. Tatum was first, he looked at my list and asked what it was. I said, “It’s my shopping list for the dealer room. Why?” Tatum replies, “Oh! 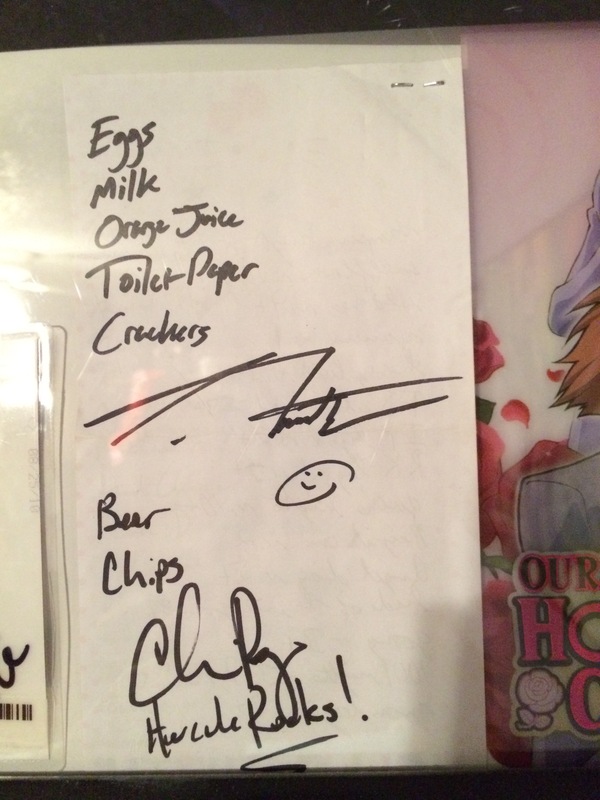 Then I’ll add a few grocery items.” He literally did add a few items to the back of my list and signed it. Then Sabat got my list and said, “Nice! I’ll add some items, too.” That was one entertaining and fun experience that I’ll never forget and said shopping list is framed within a collage for that year. Maybe I’ll add a picture of it later. Is there a character that made you exclaim, “That’s me!”? One thing you want to accomplish that you’ve been putting off? Read/watched anything that left a lasting impression? One adds the essentials, the other is ready for a party, lol. Hahaha, that’s hilarious! If you get the chance, I’d love to see a picture! I’d like to see a Trigun remake as well. I enjoyed both the anime and manga, so I wouldn’t mind revisiting Gunsmoke again for more than just a movie. Both Tatum and Sabat are jokesters, so I really shouldn’t have been surprised by the unique autograph. xD Set a reminder on my phone for when I get home, so I’ll take a picture of it.